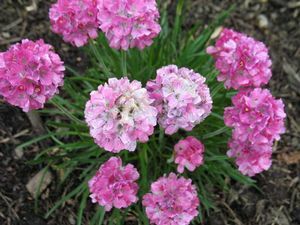 Outstanding for its continuous show of vibrant, rose-pink, round 1” flower heads on 6-8” stems from May to July. 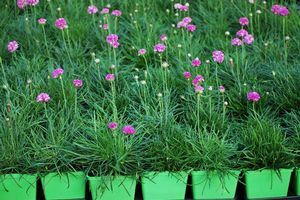 Dwarf and mound forming, its grassy foliage provides the gardener an excellent choice for edging, for use in beds, borders, or for the rock garden. 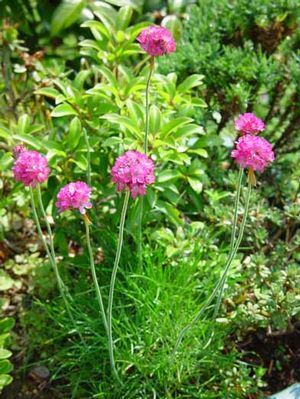 The species name attests to its origin as a maritime coastal plant native to Europe where it was a valuable ornamental plant for knot garden. Early cultivars of the species result from the crossing with A. setacea and the larger A. alliacea. Follow a regular watering schedule during the first growing season to establish a deep, extensive root system. Feed with a general purpose fertilizer before new growth begins in spring. Prune old flower heads to encourage more blossoms. Do not prune in fall. Remove dead foliage in spring.